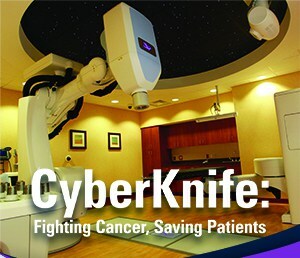 The CyberKnife® Robotic Radiosurgery System is one of the newest weapons in the fight against cancer. It is also one of the most powerful. At Saint Francis Medical Center, the remarkable results are starting to roll in. The only one of its type in the region, Saint Francis’ CyberKnife System offers a noninvasive alternative for the treatment of cancerous and noncancerous tumors anywhere in the body, including the prostate, lungs, brain, spine, liver, pancreas and kidneys. Because it delivers beams of high-dose radiation with extreme accuracy, it is ideal for patients with traditionally inoperable or surgically complex tumors. 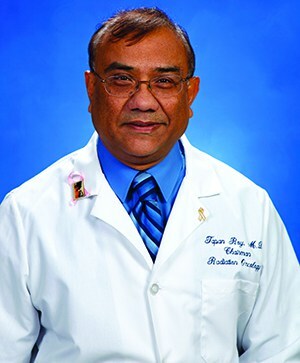 The system uses sophisticated image guidance software to track and continually adjust treatment for any tumor movement, allowing patients to breathe normally and relax during treatment. Unlike other options that can result in hair loss, overnight stays and painful recoveries, CyberKnife treatments cause minimal side effects (or sometimes none at all) that usually diminish quickly. Common side effects may include nausea and fatigue.